When we think of actors, we immediately jump to the names of our favorite A-list actors like Robert Downy Jr., Tom Cruise, or Brad Pitt. You know, the ones who are only in one or two movies each year. So for the first post in our actor section, I decided to stray from the norm and talk about a television actor. I figured, why not pick the best television actor of all time, Bryan Cranston. Yes, I know that is a bold statement, considering television has been around for nearly 70 years, but by the end of the article, you will be on my side (or at least closer to accepting it). Before we get into the gritty details of this debate, I want to make it clear that I am strictly discussing his acting in television only. Cranston’s first recurring role was on the 1988 show Raising Miranda, which was cancelled after the first season. It would not be until the mid nineties when Cranston finally found himself as a recurring character on a show that lasted more than one season. Fortunately enough for him, that was the biggest show of that decade: Seinfeld. 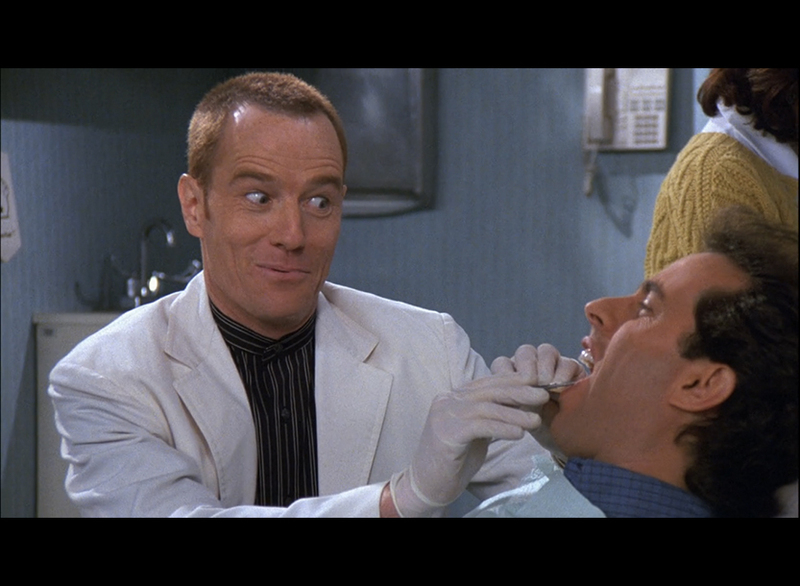 During his time on the show, Cranston played dentist Dr. Tim Whatley. Several of Seinfeld’s most memorable episodes and sayings actually originate from Whatley, including becoming the original “regifter.” The most memorable moment of Cranston’s contribution to the show comes when Whatley converts to Judaism simply so he can tell Jewish jokes to his patients. The episode, “The Yada Yada”, was ranked by USA Today as the 7th best episode of Seinfeld of all time. In addition, in 2014, Rolling Stone Magazine placed Cranston’s character as the fourth best side character in the show who was not related to the main cast. While he definitely did contribute to the legacy of Seinfeld as a bit character, we will be able to see in his next role how good of an actor he can be as part of the main cast. In the year 2000, Cranston was finally part of a main cast in a show that would run for 7 seasons, where Cranston would appear in all 151 episodes. This show would be, Malcolm in the Middle, and will serve as the first show in which we can start considering Cranston a serious actor. In the show, he plays the role of Hal, the father to a dysfunctional family that centers around a boy genius, Malcolm (played by Frankie Muniz). Throughout the course of the show, Cranston played a character who was the opposite of the parents we were used to seeing on television. Instead of being the responsible adult that sets the course for the family, Hal was an emotionally unstable adult who was more of a child than his five sons were. Whether dancing around the school playground in roller blades or renting a steamroller using his sons college fund, Hal was always up to some neurotic activity that kept the audience coming back for 7 seasons and netted Cranston 3 Primetime Emmy nominations. However, Cranston would truly break (bad?) into the category of best television actor of all time in his next role. In 2008, Cranston would begin what would soon become the biggest role of his acting career. This is, of course, the role of drug lord Walter White (A.K.A. Heisenberg) on AMC’s Breaking Bad. The show has been an unbelievable success since the show first premiered all the way until its finale, which drew in a record breaking 6.6 million views. The show remains a pop culture icon all because of the fedora-wearing, sun-glassed figure that Cranston brought to life with his phenomenal acting, which made him only the second person of all time to have 4 Emmys for acting in a lead role. The most impressive part is that he was nominated all 6 years Breaking Bad was on television, and won 3 of years in a row. To sum up this article, we have looked at several pieces of evidence that proves Bryan Cranston is the best television actor of all time. During this process we examined 3 shows in which Bryan Cranston has showcased the impact of his acting, from the level of a bit character all the way to the leading actor. These three series were some of the highest rated television series of all time, and Cranston has definitely proven his contribution to these shows with a grand total of 9 Emmy nominations and 4 wins for his acting. Thank you for visiting Cinema Celluloid today. Please vote on whether you agree or disagree with our judgment and remember to comment on who you think the best Television actor of all time is. [polldaddy poll=9012013] Written by: RJ Thompson Edited by: Destiny Serna Note: Images are likely under copyright of the publisher or creator of the work depicted. Images are used under fair use. Please contact us if you feel your copyright is being infringed upon.